Is it really Week 52? I am always so thankful each year for a 'down week' this week between Christmas and New Year's Day as there is so much for me to accomplish on the running-a-household end of things. Anyway - Back to Groceries! I went to Fred Meyer Monday night because we needed some fruit and I needed some almond flour for a baking projected. There was Almond Coconut milk on clearance for $1.59 so I bought 6 half-gallons. It has a long shelf life and I'm doing my first ever detox starting January 12 that will allow almond coconut milk, but not any dairy. So I'll use this for cooking, in my oatmeal, etc. Butter was on sale for $2.50/lb and I found some Glutino cookies on clearance. I spent $31.99. That almond flour was a whopping $9.99! I was at Albertson's Monday, too, during a last-minute fill-in therapy session for a kiddo. 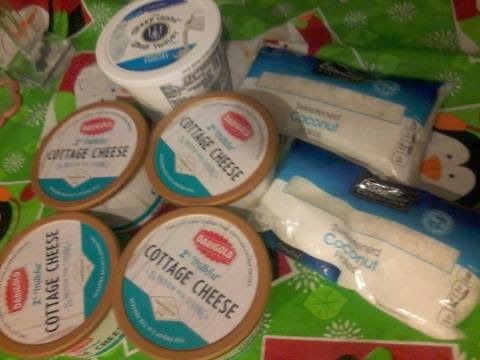 I picked up cottage cheese that was on clearance for $1.00, clearance yogurt and more coconut for baking. I spent $9.19. Friday morning I went to Fred Meyer for their 75% off Christmas stuff, an annual tradition. 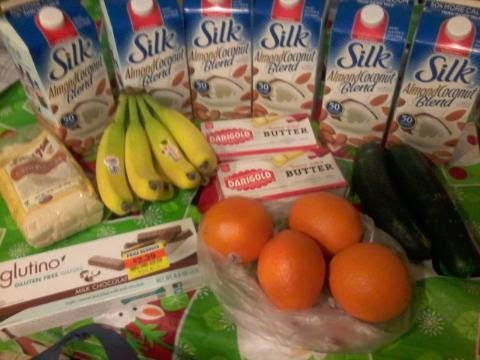 I picked up a gallon of milk for $5.39 and then headed to Safeway for the $5 Friday deals. I bought chips & GF corndogs and found some cheapie frozen meal things that DH likes for $0.50 each. I spent $14.01 at Safeway. I went to QFC because I was sure they had spaghetti sauce on sale, but I was wrong. I did find some excellent clearance deals though. I bought 15 packages of ground chicken for $0.99 each. They were 13.3 oz so it works out to $1.19/lb which is pretty awesome. And I can eat it during the detox, too. Yay! Generic multi-grain cheerios were only $0.99 and I got some spaghetti & a package of GF spaghetti for DD#2. Marshmallows were also on clearance for $0.79. I am just now realizing I left a bag at the grocery store! DH tells me I should just go in with my receipt and explain. Yeesh. I left behind a summer sausage roll, 2 of the chicken packages, some cottage cheese, and one can of spaghetti sauce. Super mad at myself. It's worth about $7.50 so I'll at least ask. I spent $36.89 including the stuff I left behind. I picked up one big bag of chips at Costco yesterday for $3.59. I need it for a party this coming weekend. I can't believe I came in under $100 per week! I guess it made a huge difference NOT to buy a 1/4 cow this summer and to get so many leftovers from our church kitchen early in 2014 when I was helping out so much.